This monument to troops who fought in the Mexican-American War battle at Resaca de la Palma in 1846 will be moved to the nearby Palo Alto battlefield site. BROWNSVILLE — New home, same history. 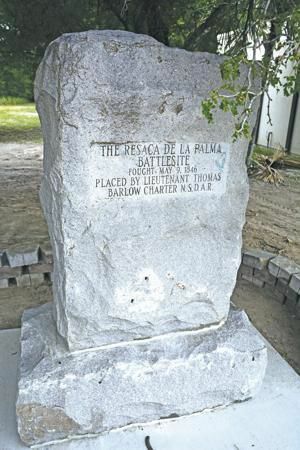 A monument to American troops who fought at Resaca de la Palma on May 9, 1846, is about to be removed and re-installed at the Palo Alto Historical National Battlefield Park about five miles north on Paredes Line Road. The four-foot-tall granite monument was put in place by the Lt. Thomas Barlow Chapter of the National Society, Daughters of the American Revolution to commemorate one of the battles in what is now Brownsville during the Mexican-American War. It was placed along Paredes Line Road at the front of the Resaca de la Palma Battlefield in 1931. Like most of the area, the monument’s site has been overtaken by the City of Brownsville’s growth. A tiny turnout along hectic Paredes Line Road allowed brave motorists to pull over and view the four-foot piece of granite with its carved inscription. The monument already has been removed to a safer distance at Resaca de Palma, and is now about 200 feet away from the road. A public dedication ceremony will be held at the new Palo Alto site with park officials and DAR officials on Feb. 2. “The Daughters had come to us, and it wasn’t that there was a problem there, but the biggest issue was a safety issue,” said Rolando Garza, archeologist/chief of resource management at Palo Alto battlefield park. “Paredes Line traffic has increased like everywhere. “It wasn’t very visible, and with all the traffic, it wasn’t safe for people to pull over and see that,” he added. The Resaca de la Palma Battlefield unit is a bare-bones historical site, with restrooms, a walking trail, interpretive waysides and a picnic area. Gates are open Tuesday through Saturday from 9 a.m. to 3 p.m. and entry is free. The site was recently put under the umbrella of the Palo Alto Historical National Battlefield Park, which is about five miles north on Paredes Line Road. The Battle of Palo Alto was fought on May 8, one day before the fight at Resaca de la Palma. Garza said National Park Service officials are grateful to the DAR for offering to move the monument to the Palo Alto site. He said it really isn’t clear just where the Battle of Resaca de Palma actually occurred, but the granite monolith will remain in proximity to what is believed to be the general battle area. “Now we will have it inside the park and it’s a much safer environment for people and it fits with us commemorating and interpreting the site of Resaca de la Palma,” Garza said. The monument push at Resaca de la Palma and other Mexican-American War battle sites began in 1914. Gen. James Parker, who headed the Brownsville Military District, returned from Fort Houston with four aging pre-Civil War siege guns intending to mark sites of major battles of the Mexican-American War. According to records in the archives of the Lt. Thomas Barlow Chapter of the NSDAR, the effort was attributed to the efforts of Franklin C. Pierce of Brownsville. One cannon was placed in 1916 on Galveston Ranch on U.S. 281 at the site of Thornton Skirmish, the first recognized engagement of the Mexican-American War, DAR archives show. The cannon and a commemorative plaque remain in place. Another cannon was placed within the breastworks of the old earthen Fort Brown erected by Gen. Zachary Taylor in April 1846. The other two cannon originally identified the sites of the battles of Palo Alto and Resaca de la Palma. The cannon replaced marble slabs which had marked the sites for many years.